Summer Blockbuster…ok not quite, but still good. 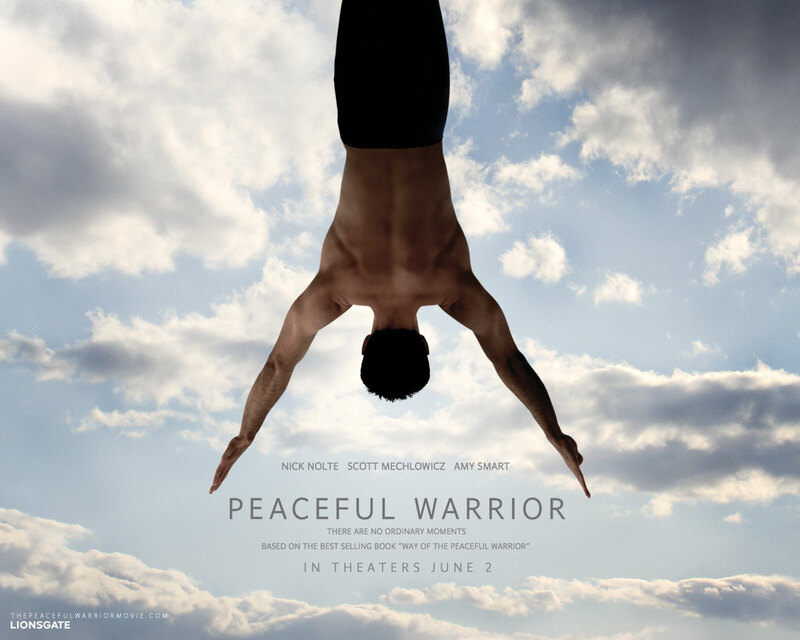 Peaceful Warrior is a must see for every serious martial artist, although you wouldn’t know it necessarily from the story line. The movie, which was released in 2006 and “stars” Nick Nolte (not much of a star…I know…but give it a chance), is a drama depicting the real life story of college gymnast Dan Millman (the movie is based on his biographical novel). At the beginning of the film, Dan is a cocky, partying, college athlete at UC Berkley. He revels in fame and recognition within his university while dreaming of winning a National Championship competition. Everything is shattered when (spoiler alert!!! although come on…it’s a bit predictable!) Dan “shatters” his leg and suffers a career blowing injury in one of his meets. Having hit an all-time low in terms of his self esteem and ambition, Dan’s path crosses with that of a gas station attendant (played by Nolte) who seems to possess extraordinary abilities and wisdom, both of which rival that of Mister Miyagi. Through his time spent learning from and being “tasked” by this unusual character, whom Dan calls Socrates, he learns all the lessons that every good martial artist should internalize: live in the moment, be mindful, the journey is more important than the destination, the greatest enemy is one’s self, etc. all the while getting back into fighting (er…cartwheeling? shape) and developing the budding romance he has with Joy (played by Amy Smart, although honestly I can’t remember what her actual role was supposed to be in the film, dramatic effect I guess?!). The end of the movie, again somewhat predictably, shows Dan actually living out Soc’s philosophy in the midst of competition on the High Rings (hence the movie poster)…with the tournament commentators frantically speaking in the background, the screen goes blank and we are left to ponder the movie’s final moments. Though a bit cheesy and predictable, and at times over-the-top (come on people…it’s just gymnastics! ), I really enjoyed the movie Peaceful Warrior. I was actually forced to watch it (along with Gattaca…another great film with a great lesson btw!) by my personal trainer a few years ago when I was in the lowest of low points in terms of my own hard work in the gym. And I have to be honest, the film really helped. It reminded me of all the things I had always been taught as a martial artist but which I had often failed to apply to other aspects of life. Our practice, as martial artists, should be a holistic one after all, and this film points out how best to see that and make it happen. It also reminds that we are in charge of our own destiny and therefore the only thing limiting us or our potential are our own thoughts and expectations. So all in all I would highly reccomend it. I know it doesn’t have cool cats in yellow jumpsuits kicking a** all over Asia but it’s still a great movie full of important lessons for any martial artist. Take a gander this summer if you have a chance and post a comment letting us know what you thought of this film!